It is our wrong ideas that Cookies can only made with egg. You can also make eggless cookies. Here I made eggless ginger cookies and try to decorate it with some cream, jam and other ingredients to make your Christmas enjoyable. You can use egg instead of milk in cookies. 1. Preheat the oven in 350 degree F for 5 minutes. 2. Line a baking sheet with butter paper. 3. In a bowl, mix all the dry ingredients (flour, ginger powder, cinnamon & cardamom powder, baking soda and salt). 4. In another bowl, mix the rest of the wet ingredients (molasses, oil, butter, milk and sugar powder). Mix and beat it very well. 5. Add dry mixture to the wet mixture slowly and on the other hand whisk the mixture continuously while pouring the flour mixture so that any lumps will not form. 6. Fold it by using spatula and make firm dough. 7. Make a smooth flat ball of tablespoon size and arrange them in a cookie sheet. You can make some small and some little big size so that it could easier for you to make snow man. You can also give it in different shape and cut the cookies with different shape cutters. 8. Bake all these in preheated oven for 12-15 mins. 9. Remove it from oven and let it cool in a cooling rack. 1. Take a bowl and add the cream. Whisk the cream to make it fluffy. 2. 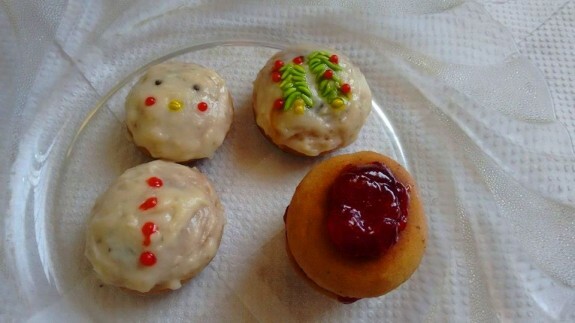 Now spread the white fresh whisk cream on small and big size cookies to make head and body of snow man. Decorate the snowman with red and green vermicelli as like picture to give it perfect shape. Note: You can decorate anything on the cookies, like Christmas tree, Santa Claus, snow man, chocolates or anything as per your wish. Also you can have the cookies simple without any decoration as the ginger cookies itself is very yummy and tasty.